On Saturday, December 1st, plan to spend your day in Historic Stanardsville as our small town officially starts the holiday season. Featuring the Chamber of Commerce Parade of Lights, Breakfast with Santa, food trucks and our very own Holiday Bazaar and Christmas Market and the lighting of the town Christmas tree, this is a wonderful family-friendly day of events. 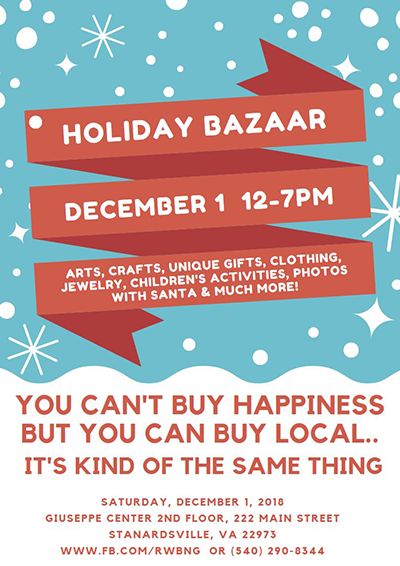 From 12-7PM the annual Stanardsville Holiday Bazaar and Christmas Market will be held at the 2nd floor of the Giuseppe Center. Featuring dozens of local vendors, crafters, artisans, and gift sellers, this charming small town event will feature something for every member of your family. Santa’s Workshop: Hosted by Piper Ivy Preschool, children can enjoy story time with a host of Christmas characters, decorate do-it-yourself ornaments that are sure to become keepsakes for their parents and grand-parents, and write letters to Santa. Reindeer Games: Hosted by End Games, teens and tweens can enjoy a host of the latest electronic and board game fun. Candy Cane Lane: Perfect for the young and young-at-heart, get your face painted by Mrs. Clause or have your photo taken with Santa. Don’t forget to stop by Mrs. Clause’s Kitchen while you’re there where you can enjoy hot cocoa, delicious entrees, delectable sweets and more all while enjoying seasonal music and exploring vendors of all types in our Elf Emporium. All event proceeds go to benefit the Red, White, Blue ‘n Greene—home of Central Virginia’s largest community fireworks display two years running.